I was fortunate to be in New Mexico for a mini-family reunion in late June. I also had an opportunity to SOTA-activate a few local peaks including Sandia Crest (10,678 ft/3225 M) which overlooks Albuquerque. 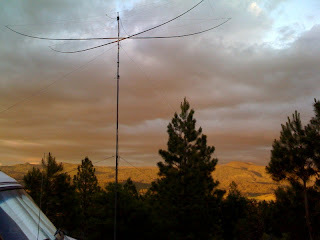 And a few days later, several joint SOTA-activations with Fred/KT5X who later invited me to join their award-winning, #1-in-category, Field Day team in northern New Mexico near Chama. What a great FD experience! First we were truly in the "field", no electricity, no generators, only solar panels and batteries. Although we did have good cellphone coverage, so we weren't totally disconnected. And no amenities like nearby restuarants, late-night pizza deliveries, hot water, well, you get the point. I had become disillusioned with the "town park" type of FD efforts where folks are more interested in supper then back home for all the comforts of home, leaving two or three stalwarts to man the radios. Over the past 10 yrs, Fred/KT5X has built up a highly competitive team, a set of 2-element Moxons for 40-15m, and a great location with a big hill downslope to the east and northeast, thereby providing some RF propogation enhancement for our QRP-battery signals. Over the past several years, the FD club call of W5YA has been number 1 in the 3A-battery/QRP class and ranked in the top 10-15 for ALL classes. So it was a special treat to participate with a dedicated group of "contest-capable" but yet "elmering-oriented" folks in a more traditional Field Day location. Antenna setup was a breeze. The team had perfected the deployment of the single band Moxons (15m, 20m, 40m) for either a dedicated 20 ft mast or 4 strategically located pine trees for the 40m Moxon. The 80m dipole was strung across a wash between two 40 ft pine trees where the feedpoint was probably 60-70 ft high and angled northeast. After the 24 hour effort, the team of 3 transmitters and eight operators including a VHF 6m station (no openings so only a few qsos) and a GOTA CW station (which had over 250 qsos!) amassed over 1,925 qsos and a total score (including bonus points) of nearly 20,000! Looking at the past year scores, this will certainly be a top 10 finish for ALL entrants! Not bad for a QRP 5 watt set of stations! 1) IF you think you are "strong", you will be. In other words, act as if you have a strong signal which means a lot of CQing interspersed with rapid band searches to pounce on new stations. This strategy is very productive as most (maybe 80%) field day operations are in Search and Pounce modes. If you can keep a clear frequency, they will find you. If not, S&P until you find a clear frequency then CQ again. 2) Focus on CW as it has a distinct points advantage over SSB. 3) "Nurture" a GOTA station. Not only can you elmer a new operator(s) but the points are "free" meaning you don't have to count the GOTA station in your transmitter total. 4) Build efficient and effective antennas. I was surprised at the front-to-back signal strengths of the 2-element Moxons plus the gain certainly helps the 5 watt signal. 5) "Sit in the chair", the contesting mantra for accumulating a lot of qsos! But with enough folks to man the 3 transmitters, everyone got a good break but certainly a lot of operating time. 6) Use the "best" transceivers possible, in this case, Elecraft K3s. It was a pleasure to share FD with these folks! Thanks Fred/KT5X for the opportunity. I had the fortunate opportunity to use a new Elecraft KX3 (Ser# 23) while on a mini-DXpedition to Montserrat/VP2M April 8-16th. This included both Villa base station and beach /p operations. Disclaimer: I am a K1, K2, and K3 owner/user. I am a huge supporter of Elecraft products and frequent drinker of the Elecraft kool-aid! I also have used the Yaesu FT-817, FT-857, and FT-897 portable radios. 1) The KX3 is much lighter and smaller than I expected. Yes, I saw/touched the Elecraft booth rigs at Dayton last year, but to have it in your hand and using it is much different. Maybe it was just the excitement of actually being able to use it! 2) It is an SDR (software define radio) but you would not know it. It functioned nearly like my more traditional K2 radio. 3) What a pleasure to have a BIG display that was easy to read in bright, daytime sunlight conditions. Especially compared to the Yaesu rigs! 4) The panel layout was functional and relatively intuitive. But you DO need to read the operating manual. Lots of functionality layered, so-to-speak, in the multi-function knobs or push-buttons. 5) Not all the knobs or push-buttons operate the same as in the K3. If you are a K3 user, you will have to read the operating manual to understand the different key functionality. However, the learning curve is short and soon you are navigating the panel efficiently. But do read the operating manual! 6) If you are familiar with the K3, the “Menu”, “Config” , and “Display” keys are intuitive and logical. But do read the operating manual! 7) Performance was excellent! I had some raging pileups as VP2MUN/p where the filtered passband of about 600 hz had “dozens” of CW callers, all seemingly 20+ db over 9 on the S-meter. No detectable artifacts, no AGC pumping, no overloading! I get the same performance on my K3 with the tight roofing filters! 8) I was initially “suspect” of the new, connected CW paddles. However, once the paddles were adjusted, I quickly learned to really “like” the paddles. They have a good feel. I do still like my outboard Palm Mini-paddles, however. 9) The onboard ATU was fast. I didn’t test it, however, on challenging mismatches like an EFHW antenna. 10) The built in speaker is adequate. I use earbuds (since I am mostly a CW operator) and the audio volume is more than adequate. Small outboard speakers could provide that “shack presence” if you wanted. 11) I did operate the rig on SSB with my Yamaha CM500 mic and headphones. I did adjust the compression and equalized the transmit audio for my voice per the recommended guidelines using the ALC menu per the manual. I got “great” audio reports and many folks gave unsolicited “great punch” reports and were surprised I was “only” running 10 watts. Plenty of audio drive for the Yamaha headphones. 12) Battery current drain was low but then I’m also used to my K2. 13) Elecraft support was exceptional. Wayne of Elecraft had emailed me prior to the trip indicating his immediate support if we had any “issues” while operating the rig. 14) I used a 4S2P outboard A123 battery to power the KX3. I did not use the internal battery pack on my /p operations but Paul/KB9AVO (Ser#24) did use the internal pack for some PSK31 contacts where it worked fine according to him. I monitored my battery voltage via the KX3 Display setting and never saw it dip, i.e. after two hours of 50% duty cycle operating I was still on the linear discharge curve for the battery. 15) On one /p operation to a local beach, the ambient air temperatures in the shade were in the low 90’s. Humidity was typical “tropical”. I operated on both 20m and 17m CW. I never saw the PA temperature rise above 54 C. And in minutes, it would drop into the high 40’s C. The backside of the case was “warm” to the touch so the PA heatsink was doing its job. It was fun to operate the KX3 as a portable and base station rig. I could easily see, given the performance characteristics, that this rig could become your “one rig does all”. Now that shipping has begun, I hope you too will soon get to enjoy this finely crafted transceiver. Another terrific "Buddies in the Caribbean" mini-DXpedition trip into the Caribbean, this time to VP2M (Montserrat) on April 8-16th, 2012 with a new group of Buddipole owners who have never experienced the "other side of a pileup"! And if that wasn't enough excitement, we had two of the new Elecraft KX3's (Ser#23 and #24) with us which only added to the pileups, especially when we were beach portable! 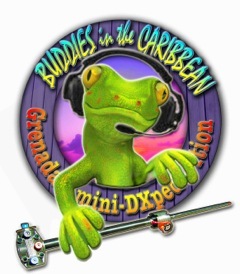 This was the first DXpedition using the new KX3 radio! What an honor for Buddipole! Because of severe baggage limits on the Antigua to Monserrat flight segment (only one bag under 50 lbs! ), we were certainly limited to 100 watt or less low power radios and the Buddipole portable antenna systems. Yet our goal was to demonstrate "ultralite" dxpeditioning into magnificent "vista" locations, operating field portable, battery-only radios with backpackable, lightweight antennas and most of all "having fun" on the "volcano isle" or before the volcano started eruptions in 1995, better known as the "Emerald Isle". It was fascinating to visit Plymouth, the now abandoned capital city and once major population center for the island. Just a week before our arrival, restricted Zone C was opened for "approved tours" which took us to a hill overlooking what was once a thriving downtown and major port area but now covered with 15 ft or more of ash and mudflows from the numerous eruptions over the past 15 years. Soufriere Hills is still quite active with several major lava dome buildups and then collapses resulting in more ash and lahar mudflows. See Montserrat Volcano Pictures for some recent spectacular pictures. The KX3 performed flawlessly particularly while /p from nearby beaches. Steve/wG0AT threw together a few minutes of video that you can see below. This video was at Sand Hill Beach on the northwest part of the island and features the KX3 in a CW pileup! And note how effective the noise blanker deals with some S7 pulse noise encountered on the beach! We stayed at Gingerbread Hill Villa, a very ham-friendly Villa located in the northwest part of the island with clear shots to NA and EU. The pileups were outstanding in spite of the low propagation numbers. We had evenings where 10m was open well past 11 pm! Our neighbor, a house about 100 yds away from the Villa, had a "pet" parrot named Jade. Jade became a DXpedition regular at the Villa, coming over to visit us in the afternoons. Maybe it was all the jalapeño-flavored chips we were feeding him? Jade would perch on an operator's shoulder and "critique" the operators effectiveness! Or was it the high RF environment? Earphones were required as a "screech" from Jade was at least 100 db! And the immutable law of physics, that "what goes in, must come out", was upheld. But not one operator was "christened"....some near misses however! About 5 pm, the telephone would ring with Jade's owner asking, "is my bird down there?". Can you send her home!" Of course you can imagine the "pun fun" we had with Jade. The eight operators were: Budd/VP2MFF (W3FF), Guy/VP2MUN (N7UN), Paul/VP2MVO (KB9AVO), Larry/VP2MLR (W7DGP), Russ/VP2MQR (N7QR), Tom/VP2MTM (K2GSJ), and Chris/VP2MYZ (N2YYZ). There were several Gingerbread Villa stations in operation on 80-10m using CW, SSB, and RTTY or PSK. At the same time, several teams were battery-only, field portable either from Montserrat beaches with the KX3 and signing callsign/p. If you are interested in going on one of these Buddipole trips, please email Budd (w3ff@Buddipole.com) for more information. 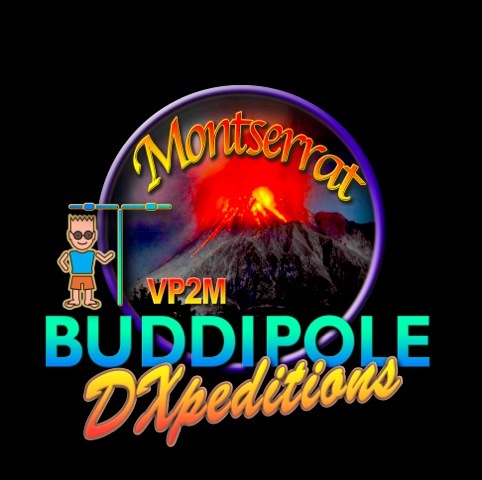 The"Buddies in the Caribbean" mini-DXpedition group is off to VP2M (Montserrat) April 8-16th, 2012 with a new group of operators who have never experienced the "other side of a pileup"! We will have two of the new Elecraft KX3's (Ser#23 and #24) with us! We believe this will be the first DXpedition using the new KX3 radio! Because of severe baggage limits on the Antigua to Monserrat flight (one bag under 50 lbs! ), we will be limited to 100 watt or less low power radios and the Buddipole portable antenna systems. Yet our goal is to demonstrate "ultralite" dxpeditioning into magnificent "vista" locations, operating a field portable, battery-only KX3 radio with backpackable, lightweight antennas and most of all "having fun" on the "volcano isle". The eight operators are: Budd/VP2MFF (W3FF), Guy/VP2MUN (N7UN), Paul/VP2MVO (KB9AVO), Larry/VP2MLR (W7DGP), Russ/VP2MQR (N7QR), Tom/VP2MTM (K2GSJ), and Chris/VP2MYZ (N2YYZ). There will be several Gingerbread Villa stations in operation on 160-10m using CW, SSB, and RTTY or PSK. At the same time, several teams will be battery-only, field portable either from Montserrat beaches or scenic mountain tops with the KX3 and signing callsign/p. QSL via LoTW, eQSL,or mail to the operator’s home callsign (SASE required).